I am pleased to inform you that Dr. Glen Van Arsdell has been appointed as Chair of the Division of Cardiac Surgery at the University of Toronto, effective October 1, 2016, to follow Dr. Chris Caldarone who has been Division Chair since 2009. Glen is a graduate of Loma Linda University School of Medicine where he completed general and thoracic surgery training. In 1996 he completed a two year fellowship at SickKids and Toronto General Hospitals. Since 1996 he has served as a staff surgeon at SickKids and Toronto General as a congenital heart surgeon. In 2001 Glen became the SickKids’ Head of the Division of Cardiovascular Surgery where he co-led a change to a Heart Centre care delivery model. His clinical practice focuses primarily on neonatal surgery and complex repairs. He has been certified as a Fellow of the Royal College of Surgeons Canada, the American Board of Surgery, the American Board of Thoracic Surgery with subspeciality certification in congenital heart surgery, and the American Board of Surgery Critical Care Certificate. He is a past holder of Heart and Stroke and CIHR funding and is a co-investigator on a number of peer reviewed funding projects. His current primary research involves a global 27 institution, 3000 patient, prospective inception cohort study looking at the type of surgical repair for tetralogy of Fallot and its impact on right ventricular health. It is the first major global surgical study of its kind in congenital heart disease. Other areas of academic interest include teaching congenital heart surgery with 3D printed models, and the development of a congenital heart program in China – a 15 year endeavour. Glen is also an editor for Operative Techniques and is a member of the Annals of Thoracic Surgery Editorial Board. Please help me in congratulating Glen on his appointment as University Chair of Cardiac Surgery, and thanking Chris Caldarone for his many years of service and leadership! Todd Mainprize has been appointed as Division Head, Neurosurgery at Sunnybrook, effective March 2016. Over the past two years in the role of interim Division Head, Dr. Mainprize has served admirably and tirelessly to advance the Division of Neurosurgery at Sunnybrook in the clinical, research and academic domains. He has been a strong advocate at the Hospital and provincial levels to secure endovascular program funding, while conducting his own groundbreaking research on targeting of the blood-brain barrier in neurooncology using highintensity focused ultrasound. He has made excellent progress in Faculty recruitment, and has remained strongly committed to the city-wide residency training program committee and clinical fellowship program. Please join me in congratulating Dr. Mainprize on this important recognition of his major contributions in this leadership role. I am delighted to share with you that Dr. Nancy Baxter is the Faculty’s Associate Dean of Academic Affairs, Dalla Lana School of Public Health as of July 1, 2016. As faculty member in IHPME since 2006, Professor Baxter is a leader in healthcare services research, screening, prevention, and healthcare quality research and education. As head of the Division of General Surgery at St. Michael’s Hospital, she is responsible for educating approximately 100 learners annually in partnership with 14 surgical faculty. In the role of Associate Dean of Academic Affairs, Professor Baxter will be responsible for the promotion of innovative student learning experiences and administrative oversight of the teaching programs in DLSPH and IHPME. She is a tremendous teacher, supervisor, mentor and administrator and I invite you to join me in welcoming her to the Faculty. David Urbach has been appointed the new Surgeonin- Chief and Medical Director, Perioperative Services Women’s College Hospital (WCH), effective Juy 1, 2016. He has taken over from John Semple who stepped down after having completed 2 successful 5 year terms. Dr. Urbach is joining WCH from the University Health Network where he is the Surgical Director of the Bariatric Surgery Program and a globally recognized researcher in the area of surgical quality improvement. His formal training in epidemiology and his many leadership positions in health services research make him a terrific addition to Women’s College Research Institute. He is a prolific researcher, a surgical innovator and a highly respected leader across the system. He was selected for the position after an international search that had representation from across WCH, University of Toronto and the healthcare system. With special thanks to John Semple for his exemplary contributions over the past 10 years, and congratulations David! Andres Lozano has been reappointed as the Dan Family Chair in Neurosurgery for a second 5-year term, effective September 1, 2015. Dr. Lozano joined the neurosurgical staff at Toronto Western Hospital in 1991 and within eight years was appointed as a Full Professor in the Department of Surgery. In 2014, he became the first neurosurgeon to be appointed as a University Professor, the highest academic rank at the University of Toronto. He also holds the R.R. Tasker Chair in Stereotactic and Functional Neurosurgery at University Health Network and a Tier 1 Canada Research Chair in Neuroscience. Dr. Lozano has achieved international renown for his groundbreaking research, particularly for his use of deep brain stimulation for the treatment of movement disorders and psychiatric disease, including Parkinson’s disease, essential tremor, depression and more recently Alzheimer’s disease. Dr. Lozano has received numerous awards for his work, including the Olivecrona Medal, the Winn Prize from the Society of Neurological Surgeons, and the Margolese National Brain Prize. He is the most highly cited neurosurgeon worldwide and one of 6 Canadians to be named to Thompson Reuters select list of highly cited researchers for 2015 in the category of Neuroscience and Behavior. He has been elected to the Royal Society of Canada, Canadian Academy of Health Sciences, Order of Merit of Spain, and most recently the European Academy of Sciences. Albert Yee has been appointed as Chief, Holland Musculoskeletal Program and Division Head of Orthopaedic Surgery, Sunnybrook Health Sciences Centre effective May 1, 2016. Dr. Yee is a graduate of the University of Toronto. He holds specialty certification in Orthopaedic Surgery from the Royal College of Physicians and Surgeons of Canada and he has obtained specialty certification in Orthopaedics and Spine from the American Board of Orthopaedic Surgery. Dr. Albert Yee began his career with Sunnybrook Health Sciences Centre in 2001. He is an Associate Scientist at Sunnybrook Research Institute and is a Full Member of the Institute of Medical Science, Faculty of Medicine, with a cross appointment at the Institute of Biomaterials and Biomedical Engineering, Faculty of Applied Science and Engineering, University of Toronto. Dr. Yee is a full Professor at the University of Toronto, where he also serves as Vice Chair of Research, Division of Orthopaedics, and Co-Director of the Department of Surgery Spine Program. Dr. Laurie Klotz has been named to the newly established Chair, Prostate Cancer Research. This generous fund of $1 million dollars gifted by the donor community will help further propel Dr. Klotz’s world changing research in prostate cancer for years to come! Dr. Klotz is currently a Professor of Surgery at the University of Toronto and Past Head, Division of Urology, Sunnybrook Health Sciences Center. He is currently chair of the Canadian Urology Research Consortium (CURC) and the World Urologic Oncology Federation (WUOF). During his career he has authored approximately 350 peer-reviewed scientific publications and 5 books. He has been a visiting professor at more than 100 universities worldwide. He was awarded the Queen’s Jubilee Medal in 2013, the Lister Prize and the Society of Urologic Oncology Medal in 2014, the Order of Canada and the Canadian Cancer Society Harold Warwick Prize in 2015, and the Richard D Williams award from the AUA in 2016. We are pleased to announce that Dr. Gelareh Zadeh has been appointed as the Head of the Division of Surgical Oncology at University Health Network effective July 1, 2016. Dr. Zadeh completed her neurosurgery training, and a PhD in brain tumor research at University of Toronto. She is presently an Associate Professor in the Department of Surgery at the University of Toronto and a Surgeon Scientist in the Division of Neurosurgery at University Health Network. She holds the Wilkins Family Chair in Brain Tumor Research, which has a focus to promote surgical clinical trials and translation of neuro-oncologic discoveries to clinical practice. She is also the co-director of the Elizabeth Raab Neurofibromatosis Program and Director of the UHN brain tumour biobank. Dr. Zadeh has a dedicated neuro-oncology and skull base practice, including a number of multidisciplinary specialized programs: skull base, brain metastases, pituitary tumors, gamma knife and neurofibromatosis clinics. In parallel she has an active research laboratory focusing on integrated multi-platform molecular analysis of brain tumors, together with a focus on understanding molecular response to targeted therapies, such as antiangiogenesis and metabolic inhibitors. She is actively involved with a number of national and international organizations in the field, including: World Federation of Neurological Surgeons, North American Skull Base Society and is presently the Secretary/ Treasurer of The Society of Neuro-Oncology (SNO), the largest organization in the world dedicated towards advance of neuro-oncology. She is excited to promote Surgical Oncology advancing its clinical, academic and educational missions; working closely together with the talent in the Division of Surgical Oncology at UHN. Avery Nathens (General Surgery) has been appointed as Medical Director of Trauma Quality Programs, American College of Surgeons. This appointment is a part time staff position with approximately 30 staff members. He has also been appointed as Medical Director of Trauma Servies at Sunnybrook Health Sciences Centre following Dr. Homer Tien who has held the position since 2010 and will remain an active trauma surgeon at Sunnybrook but will focus his leadership expertise in his role as Medical Director, Ornge. Avery holds the DeSouza Chair in Trauma Research and has spurred implementation of system changes in Ontario and internationally through his leadership of the American College of Surgeons Trauma Quality Improvement Program. Nancy McKee was celebrated and acknowledged by awarding her the Chair’s Lifetime Achievement Award in the Division of Plastic and Reconstructive Surgery. In June 2016, Nancy retired after a 37-year career at Mount Sinai Hospital. Nancy graduated from the University of Toronto Medical School in 1970 and after doing an internship at the Royal Victoria Hospital in Montreal she started her residency in Plastic Surgery at the University of Toronto under the tutelage of Dr. W.K. Lindsay. Nancy obtained her fellowship in 1976 and then did a prestigious 4-year Medical Research Council of Canada Research Fellowship under the supervision of Dr. Ralph Manktelow. Her interests in research and the pursuit of academia started early and remained an undying passion with Nancy. In that era, the concept of the Surgeon- Scientist was in its embryonic state and Nancy’s career trajectory is a testament to its importance in academic surgery. Nancy started her staff appointment as the first divisional female member at the University of Toronto in 1979 and became a full Professor in 1993. In her typically idiosyncratic and creative manner, she has maintained several unique staff cross-appointments in both the University of Toronto School Of Physical and Health Education (since 1988) and the Department of Kinesiology at the University of Waterloo (since 1997). In this way, she has been able to expand the horizons of our specialty and develop collaborative and fruitful relationships with groups that don’t routinely cross the path of the Plastic and Reconstructive surgeon. Most notably she has been integral in the success of several Surgeon-Scientist trainees including Dr. Bill Kuzon, Dr. Howard Clarke, and Dr. Joel Fish all of whom have risen to high levels of prominence in the academic arena of Plastic and Reconstructive Surgery. Nancy’s contributions to the research profile of Plastic and Reconstructive Surgery cannot be overstated. At a local level, for years she continued to run research supper clubs at her house allowing opportunities for the research community here at the University of Toronto to get together in a collaborative and collegial fashion. Nancy has been a lifelong supporter of the Plastic Surgery Research Council and brought this remarkable meeting to Toronto in 1992 where she was the Chair. Generous, collaborative, broad-minded, idiosyncratic, sensitive, innovative, loyal and dedicated. These are terms that come to mind when one reflects on Nancy McKee and her career. It is safe to say that her investments in the field of Plastic and Reconstructive Surgery have enriched and fostered the specialty. Congratulations to Nancy on a remarkable and rich career and thank-you for all that you have done for our division. Doug Wooster (VasSurg) has been appointed as the inaugural Director of Physician Mentorship & Wellbeing at St. Joseph’s Health Centre. Fred Gentili (Neurosurgery) has been appointed as the Crean Hotson Chair in Skull Base Surgery at University Health Network for 5 years. John Coles (CardSurg) has been appointed as the Clinical Fellowship Coordinator for Cardiac Surgery at the University. Robert Cusimano (CardSurg) has been appointed as the Program Director for the Division of Cardiac Surgery at the University. Michael Cusimano (NeurSurg) was at a signing for his new textbook, Handbook of Skull Base Surgery, Thieme Publishers on Wednesday, September 21 at the Li Ka Shing, CIBC Hall. His Co-Editors were John Lee and Antonio Deleva. Steven McCabe and a multi-disciplinary team successfully completed Canada’s first transplant of the upper limb. The procedure lasted approximately 14 hours during which a team of 18 surgeons attached the forearm and hand matched from a donor to a patient who had been evaluated as a suitable candidate. This required the cooperation of a variety of different surgical disciplines from a number of hospitals and the University of Toronto. On May 24, Andres Lozano and University Health Network CEO Peter Pisters welcomed the Honourable Kathleen Wynne, Premier of Ontario, to Toronto Western Hospital to tour the Magnetic Resonance-guided Focused Ultrasound Lab (MRgFUS) facility. The visit stems from their participation in the Premier’s Business Mission to Israel on May 16-17, 2016, during which time a Memorandum of Understanding was signed between UHN and Insightec to fund a FUS research and training program. Premier Wynne was given a demonstration of the non-invasive technology by the FUS team and spoke to the media following the tour. A press release from the Government of Ontario can be accessed at: https://news.ontario.ca/opo/en/2016/05/israel-ontario-agreements-to-promote-advancements-in-life-sciences.html. 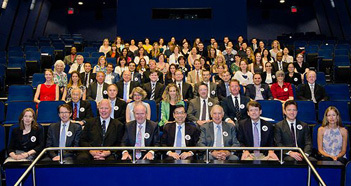 In 2003, the first Lindsay-Thomson Pediatric Plastic Surgery Symposium was held at the Hospital for Sick Children. This CME event was designed to acknowledge the contributions and achievements of our mentors and teachers, Drs. W. K. Lindsay and H. G. Thomson who collectively accumulated 90 years of clinical practice at the Hospital for Sick Children, by showcasing what is going on in the division. This year, something a little more special was done by using the Twelfth Annual Symposium to recognize the career and accomplishments of Ron Zuker. In June 2015, after 37 years, Ron retired from active clinical practice but continues to remain active with select participation in cases and involvement in SickKids International and global outreach. His contributions in the arenas of cleft surgery, microsurgery, separation of conjoined twins, congenital hand surgery, composite vascularized allotransplantation and free-functional muscle transfer most notably in restoration of a smile are unparalleled and he has had a career to be envied. So we invited 22 of his former fellows and best friends from all points of the globe to come and speak…. and you know what? They all came! 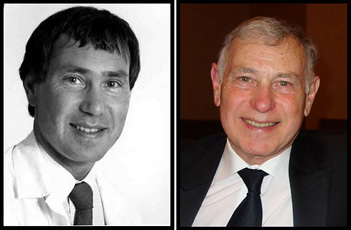 Dr. Michael Goldberg, a retired staff member in the Division of Vascular Surgery, Department of Surgery from 1973 to 2008, passed away April 1, 2016. Michael was an empathetic and talented surgeon and educator, who won multiple teaching awards through his career. This two-day program will update practicing surgeons, postgraduate trainees and other health professionals on current topics in thoracic surgery. Visit the conference website for 2017 program details. The 3rd Annual David Balfour Lecture in Surgical Ethics will be presented at the Peter Gilgan Research and Learning Centre, 2nd floor, Event Room 2a/b, at 686 Bay Street at 5 PM on Wednesday April 5th, 2017. This year’s speaker will be Martin F. McKneally, discussing the evolution of surgical ethics. This programme will focus on the evaluation and treatment of primary tumours of the heart. Topics will cover imaging modalities used in diagnosis, surgical options and operations, chemotherapeutic treatments and options and pathological considerations of sarcomas of the heart. Don’t miss out! Register today. The Canadian TaTME Proctorship is a community created in response to the enormous success of the Canadian Congress on Transanal Total Mesorectal Excision (TaTME). The proctorship is a platform that delivers several periodic one-day cadaveric courses on this innovative technique. It will develop a national network of trained proctors with a preset curriculum in order to nationally disseminate this technique in a safe and effective manner. TaTME offers the potential to resolve limitations found in both the laparoscopic and robotic platforms. With enhanced intraluminal and intraperineal visualisation, the potential benefits of such an approach are profound. High volume rectal cancer surgeons from across the country are invited to our one day cadaveric courses, as well as to meet their local proctors to develop technical expertise in this procedure. Register today! Entering its 17th year, The Toronto Annual Breast Surgery Symposium continues to welcome a variety of well-respected national and international leaders in the field of aesthetic and reconstructive breast surgery as guest faculty. This year we will continue to cover current concepts and new innovation in the field of reconstructive and aesthetic breast surgery. Our guest faculty will present information in a combination of didactic lectures, video presentations, open panel discussions and question and answer sessions. Register today! The Toronto Aesthetic Meeting is the largest aesthetic plastic surgery meeting in Canada. In 2017, join us in celebrating our 47th annual meeting. In this two-day symposium, through a combination of both didactic and interactive discussion, participants will learn about the latest techniques and developments in aesthetic plastic surgery. Participants will be exposed to a wide variety of both aesthetic surgical and nonsurgical procedures. Patient selection, techniques and outcomes, and patient safety are emphasized. Don’t miss this update! Register today. This four day course will give you the opportunity to be part of interactive lectures and case presentations and will conclude with smaller workshops. Delegates will be given opportunities to present their own cases and exchange ideas in an open dialogue with faculty. It is anticipated that this conference will draw interest from many disciplines involved in the management of children with Robin Sequence including Plastic Surgery, Otolaryngology, Pediatrics, Respirology, Oral and Maxillofacial Surgery, Orthodontics, Dieticians, Occupational Therapy, and Genetics. The focus of this event is to focus on the optimization of care for these complex patients and to develop international collaborations for data collection and research using the format of didactic lectures, panel discussions and small group breakout sessions. Don’t miss out! Register today.